Bring your beverage with you on those hot or cold days! 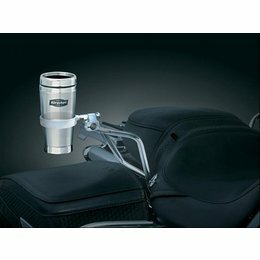 Mount your drink holder either on your handlebars or your clutch or brake perch mounts. The quick detach thumb screw mount leaves a simple clamp when not in use. Don’t let anyone walk off with your helmet! Lock it right to your bike with our Chrome Universal Helmet Lock. Works on engine guards, frame tubes, or any other 1-1/4” to 1-1/2” tubes. Don’t let anyone walk off with your helmet! Lock it right to your bike with our Chrome Universal Helmet Lock. Works on engine guards, frame tubes, or any other 7/8” to 1-1/4” tubes. There's nothing better than a hot cup coffee on a cold morning or an ice-cold bottle of water on a hot summer day. 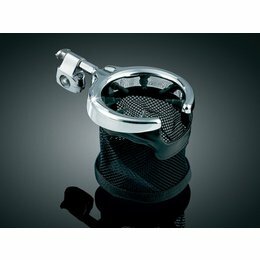 Kuryakyn Passenger Drink Holders fasten securely to the passenger grab rails on H-D Touring Models. Includes a mounting ring and stainless mug. The clamp fastens securely to the 1/2" diameter passenger grab rails found on Electra Glides & Tour Glides or can be mounted universally on any 1/2", 5/8", or 3/4" tubing.Please Note: The image displayed is representative of the item, but may vary depending on your specific model. There's nothing better than a hot cup coffee on a cold morning or an ice-cold bottle of water on a hot summer day. 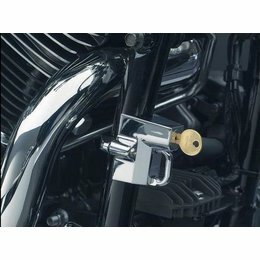 Kuryakyn Passenger Drink Holders fasten securely to the passenger grab rails on H-D Touring Models. 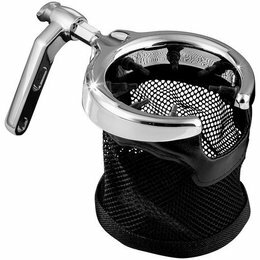 Features a basket that will hold just about any can, bottle or cup. The clamp fastens securely to the 1/2" diameter passenger grab rails found on Electra Glides & Tour Glides or can be mounted universally on any 1/2", 5/8", or 3/4" tubing.Please Note: The image displayed is representative of the item, but may vary depending on your specific model.